From their control centre in Oxfordshire, analysts from Satellite Application Catapult can track vessels around the world and watch for abnormal or illegal behaviour. 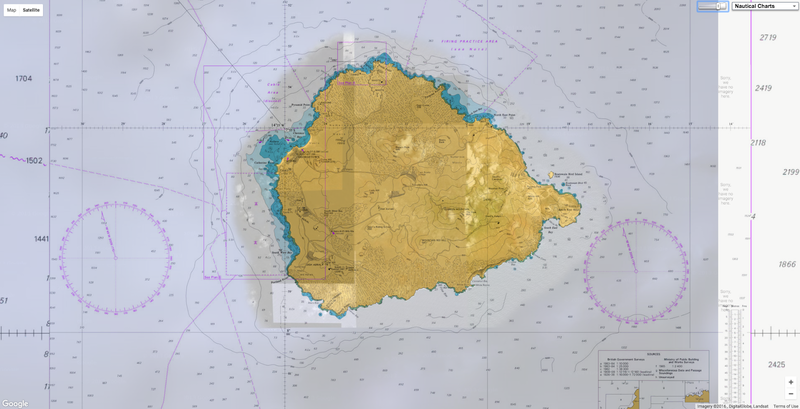 Pirate fishing vessels plundering fish from the world’s marine reserves, such as the one around Ascension Island announced on the weekend, can now be watched, tracked and brought to justice using satellite technology. Despite a proliferation of huge, publicly lauded marine reserves, actually stopping fishing in many remote areas has previously been almost impossible. Fishing vessels are required to carry a transponder that tracks their movements and allows authorities to monitor their behaviour. But illegal fishers simply switch off the machine, disappearing from the system. Take a deep dive into our groundbreaking satellite tool to combat pirate fishing. Project Eyes on the Seas uses the latest technology to track illegal fishing activity in real time, giving authorities the information they need to protect the world's oceans. A UK-funded initiative, developed by Satellite Applications Catapult (SAC) and the Pew Charitable Trusts, uses satellite radars to track these “dark targets”. Now, instead of blindly patrolling vast areas of ocean, coastguard vessels use the satellite intelligence to target their search. “We don’t put a cop on every corner 24 hours a day. So let’s at least know what the situation out on the water is [before sending boats to investigate],” said Bradley Soule, senior fisheries analyst for SAC. Satellite radar has traditionally been used by the military and law enforcement agencies. But the cost has dropped dramatically, opening up the data for private companies to use. Roughly one in every five fish landed around the world is caught illegally. In the past, said Soule, the problem was not effectively shared between neighbouring governments. This meant “there are opportunities for bad actors to move swiftly across borders and use our borders against us”. But even though the system is still effectively being trialled, having only been in development for two years, it has already been used during investigations. The details of these are not yet public. Fishing vessels tracked using transponders. Illegal vessels will often switch off their transponders and “go dark”, making them impossible to track without the use of satellite radar. Just five years after the global figurehead of the International Union for Conservation of Nature’s (IUCN) ocean protection programme, Dan Laffoley, co-authored a report that said that most marine protected area’s “are ineffective or only partially effective” he now believes the reserves can now offer true sanctuary. “The excuses that it’s far too large, it’s far too remote, it’s far too expensive are old excuses. The reality is that we do have the technology to be able to police these places,” said Laffoley. “There really is a breakthrough in terms of remote sensing,” said Charles Clover, the chair of the Blue Marine Foundation who lobbied the UK government for the creation of the Ascension marine protected area (MPA). However, he added that “the feasibility of actually taking a prosecution through the courts using remote sensing [on its own] is still questioned by the Foreign Office” and the technology would still require boats in the water. The Guardian understands that satellite technology will play a part in the enforcement of the 234,291km2 Ascension MPA. An initial study of Ascension waters using satellites found at least eight boats that had turned off their transponders and were possibly fishing illegally. SAC is already working with the UK government to track vessels in the world’s largest marine reserve around Pitcairn Island. The announcement that the UK government would ban fishing in more than half of the island’s huge territorial waters (which are a British overseas dominion) was hailed as a “massive step” by Laffoley. Ascension’s lonely volcanic peak juts from the heart of the Atlantic Ocean, almost midway between South America and Africa. Laffoley said the waters around Ascension were one of the few remaining places where the marine environment had not been irreversibly damaged by overfishing. But even here, recent years have seen a rapid decline. “There’s a fairly disastrous Asian longline fishery going off in Ascension Island waters, which paid money into the Ascension Island government to make up the shortfall [of funding] from London,” he said. When he visited last year, Laffoley spoke with locals who told him great natural events and creatures, such as “large tuna chasing fry up the beaches that they’d seen generation after generation were becoming more memories than reality”. “When we were diving there we only saw one shark and there should have been plenty,” he said. In 2015, a huge year for marine conservation, big reserves were designated in Palau, Easter Island, Pitcairn Island and New Zealand’s Kermadec islands. The Ascension reserve brings the total proportion of the world’s oceans protected from fishing to 2%. In 2002, the World Summit on Sustainable Development and the Convention on Biological Diversity committed countries to reaching 10% by 2012. Almost half of Ascension’s waters will remain open to the (mostly Taiwanese) tuna vessels that have caused so much damage in the past. However, a $300,000 grant from the charitable foundation of US hedge fund manager Louis Bacon will fund a policing presence for the next two fishing seasons in order to “ensure best practice is observed”. There is a good chance that one fish in five sold in a store or served in a restaurant has been caught illegally. That would amount to 26m tonnes - the weight of nearly 500 Titanics - of fish a year. The environmental cost of illegal fishing is huge: In the past fifty or so years one in four fisheries has collapsed, largely because of it. And the economic cost is high too: 23 billion dollars according to the Pew Charitable Trusts. But clever use of technology could help prevent this pillage. A new satellite-based surveillance centre in Britain may be a game-changer. Called a virtual watch room, it resembles the control centre for a space mission and can track fishing boats anywhere in the world with the results displayed on a giant video wall. The watch room uses satellites to pull together data from multiple sources. including radar, photographic images and the signals emitted by radio transponders which are supposed to be fitted to fishing boats. Automated alerts, such as when a vessel enters a prohibited area and slows to fishing speed, allow operators to zoom in on anything suspicious. The watch room can also spot vessels working with another ship to which they transfer their catches for transport to market. The virtual watch room has been developed by Pew Charitable Trusts and Satellite Applications Catapult. But the success of the watch room’s technology will also depend on governments and the authorities responsible for fishing sharing information and enforcing international rules and regulations. If, for example, radio transponders aren’t made mandatory on all fishing vessels, tracking them will be complicated. Industry would also need to play its part by using the watch room’s technology to protect their supply chains. The one-in-five illegal fish identified by Pew are often sold by otherwise law-abiding firms. Now those firms have a way to reliably trace where their fish comes from. If customers care enough about buying fish from sustainable sources, then retail pressure coupled with satellite technology should be a powerful weapon to combat pirate fishing. But Laffoley said this left the job of protecting the area half done. “The reality is that if you want to have places in the ocean where you’ve got the really impressive wildlife spectacles, where you’ve got intact ecosystems, where you’ve got the big old individuals that we know are more resilient and have better quality of eggs to reseed areas [then you need no-take areas]. When you have a fishery, you lose them,” he said. Clover said the fishery was kept open by necessity in order to fund the Ascension Island government. UK government funding of public services on the island is severely limited and the community has had to open up licences to the fishing operators. “It’s all about the [UK] Foreign Office not paying for this outfit,” said Clover. Laffoley seconded Clover’s call for increasing the budget to make the Ascension community viable without fishing. “We have to question why we are using the biodiversity and exploiting it, to then protect the biodiversity,” he said.